members and starts rolling pickets every weekend outside a different Domino's store, with ASF Brisbane following suit. Below is a list of six key points that must be included in any further negotiations with Dominos. The drivers will not support any agreement without these inclusions. over this would currently be basic rate of $15.96 per hour + casual loading of 23 % = $3.67 giving a minimum wage of $19.63 per hour. employees engaged on a casual basis shall have the casual loading prescribed by FWA in the minimum wage safety net included in the minimum wage payable to any casual employee. 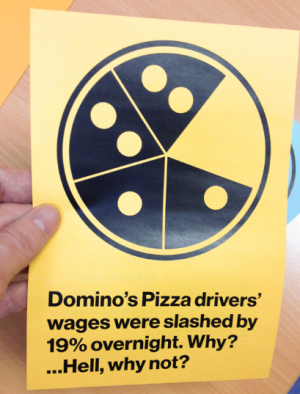 3 Payment of wages at the normal rate of pay (which will include casual loading to casual employees) shall be paid to all employees required to complete any training or attend any meeting whether that training or meeting is held in-store, via the Dominos training website DOTTI or by any other means. Payment of wages will be made for the period of time taken by the employee to complete the training specified by Dominos. 4 All tips received by drivers shall remain the sole property of the driver to whom they are given. At no time and under no circumstance will Dominos ever be entitled to any tip money received by any driver. 5 All hours worked by any employee regardless of what employment status the employee may hold will be paid for by the employer Dominos at the appropriate rate of pay. This will include all hours worked before, during and after any trading hours of any store. work performed on public holidays. The list is seen by drivers as realistic and only requests that the most basic of wage entitlements be payable. The workers are organising to achieve these goals via the General Transport Workers Association.